The women of Torah grew up at a time when gender roles were rigidly defined and girls were considered women at an early age. Still, the Torah hints that young biblical women faced challenges similar to those that teenagers encounter today: first loves, burgeoning identities, developing sexualities, and blossoming spirituality. Building on textual sources, Deborah Bodin Cohen has created a collection of midrashim about the teen years of 10 women in Genesis that will resonate with 21st-century readers. 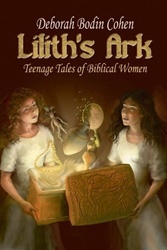 Lilith's Ark melds text, biblical commentaries, and historic details about the ancient world with the experiences of modern girls and women and the author's own imagination. A discussion guide for each story enriches the reading experience. This is a book that will speak across time to the anxieties and aspirations of today's growing girls.